Happy Monday everyone!! Today I’m participating in Kim at Newlywoodwards Dare to DIY party- this week it’s showing off your holiday table. Ok, big confession. We don’t eat at the table, except if we have guests. I’m hoping this tradition will change once we have kids, but for now it’s just easier and more comfortable to eat in our living room. This doesn’t mean we plop down in front of the TV- we usually sit and chat about our days, do dishes and THEN plop down in front of the TV- true story! Not terribly exciting, I know. But it puts me in the fall mood! My mother in-law made the small orange pumpkin runner. The green runner came from my friend’s wedding a few years ago (and you’ll see it make it’s reappearance at Christmas!) Then I put down a leaf plate, some silk leaves and mini gourds. The vase in the center used to have acorns inside it as well- we have 5 million acorns in our yard, so I thought they’d be a great vase filler. I washed and dried them- and they molded. Gross. So I tossed them. 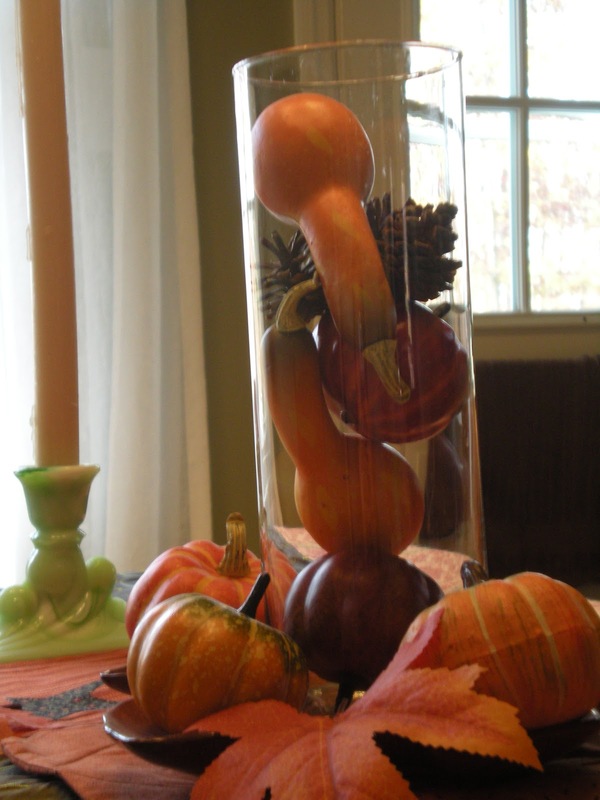 The mini gourds don’t need acorns in there anyway, right?? The candlesticks are a thrift store find- they’re a really pretty milky green with swirls of clear green in them- you can kind of see that detail in the picture below. And that’s my fall table- ta da! 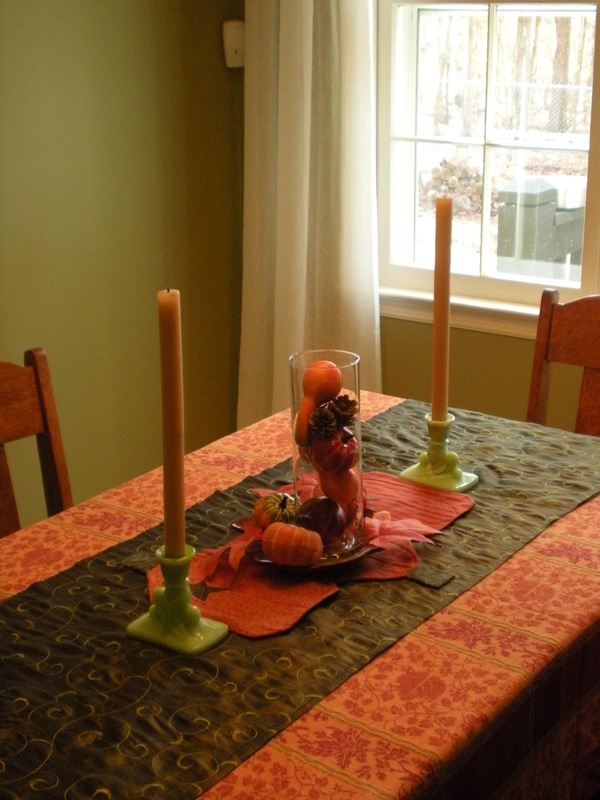 I hope you like it- and if you have a tablescape to share, link it up to Kim’s link party!! I have to say, I’m excited about the change in season. Not that it’s going to be much different here in Georgia- instead of super hot with a giant side of humidity it’s just going to be hot with a tiny bit of humidity, probably for at least another month. But- it’s fun to see fall stuff popping up on Pinterest and to know that soon the leaves are going to be changing colors. And sometimes the weather gives us a break so I can wear some jeans every once in awhile!! 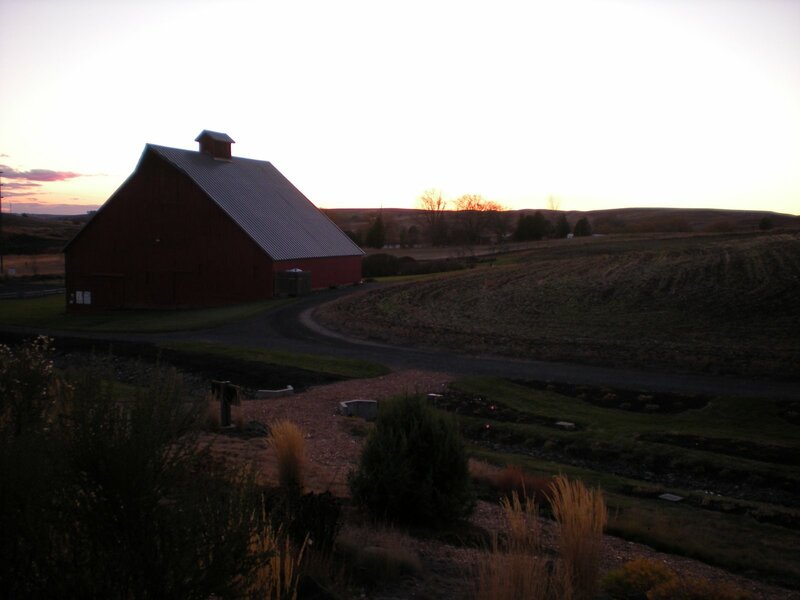 Fall in Moscow, ID- I took this photo while visiting my sister who was going to college there. I’ve decided I really enjoy seasonal changes and the anticipation of the change- looking forward to cooler, crisp days and falling leaves in fall, cold frosty mornings (yes, we get those here) in winter, things getting green and warming up in spring and even the long, hot summer days. What’s your favorite thing about fall? Do you have a favorite season?